The maximum joint spacing should be 24 to 36 times the thickness of the slab. As an example, in a 5-inch thick slab the joint spacing must be about 12’. Also, it is recommended that max. Joint spacing shall be limited to 15 feet. All panels must be squarely or nearly so. The length of panel should not exceed 1.5 times the width. Shaped panels should be avoided. Preformed plastic (or hard board) joint strips can be inserted into the concrete surface up to required depth before finishing. Tooled joints should be done early in the finishing process & rerun later to ensure groove bond hasn’t occurred. Early dry-cut joints are generally done one to 4 hours once finishing is done, depending on the setting characteristics of concrete. These joints, in general are not as deep as those obtained by the conventional saw-cut process. Minimum depth of 1 inch [25 mm] in depth should be maintained. Conventional saw-cut joints are to be run within 4 to 12 hours after the concrete has been finished. Raveling during the saw cutting is affected by strength of the concrete & aggregate characteristics. It must be delayed if the joint edges ravel during sawing. If it is delayed too long the sawing process can become difficult leading to uncontrolled cracking. Pre-molded joint filler such as compressible foam strips, asphalt-impregnated fiber sheeting, or similar materials shall be used for isolation joints, to separate slabs from building walls and footings. Min. of 2 inches [50 mm] of sand over top of a footing can prevent bond to the footing. Form circular or square openings, to isolate columns from slabs, which will not be filled until after floor has hardened. For columns, contraction joints in slabs should intersect at the openings. If square openings are used around columns, it should be turned at 45 degrees so the joints intersect at the diagonals of the square. Wire mesh will not prevent cracking. If the slab contains wire mesh, cut out alternate wires, or preferably discontinue the mesh, across contraction joints. Mesh tends to keep the cracks and joints tightly closed. Metal dowels must be used in slabs that carry heavy loads. It must be carefully lined up, parallel, or it may induce restraint causing random cracking at the end of the dowel. Keyed joints are not recommended for industrial floors. 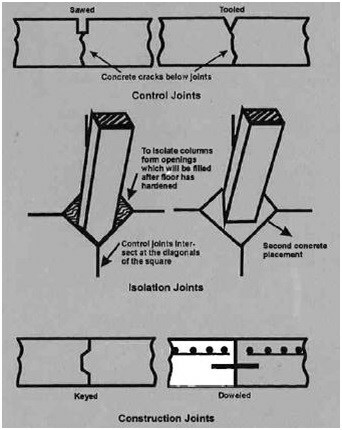 Construction joints key the two edges of the slab together, to provide transfer of loads or to help prevent curling or warping of the two adjacent edges. Galvanized metal keys are sometimes used for interior slabs, a beveled 1/2 inch strip, nailed to bulkheads or form boards, can be used in slabs that are at least 5 inches thick to form a key which will resist vertical loads and movements. Joints in industrial floors subjected to heavy traffic require particular attention to avoid spalling of joint edges. These joints should be filled with a material capable of supporting joint edges. Performance and Manufacturer’s recommendations should be checked before use.